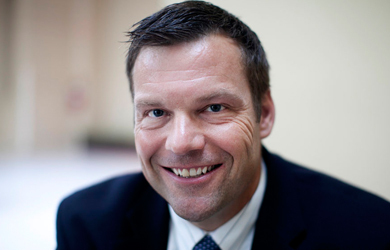 Kansas Secretary of State Kris Kobach, following a federal court ruling upholding his strict requirement that people registering to vote must present a birth certificate or comparable proof of citizenship, is now hoping to peddle the law to other states. But in a conference call last night hosted by the group True The Vote, which was founded to support voter suppression laws, Kobach inadvertently explained what is so wrong with his policy, which has left 16,000 Kansans with their voter registrations suspended. Kobach told True The Vote that he hoped that other states with voter ID laws would adopt his stricter version, and said that he had already discussed the possibility with Mississippi Secretary of State Delbert Hosemann. He also promised to put a generic version of the law on his personal website for activists to present to their own state legislators. But while defending the law, Kobach made an argument that in fact illustrates what an extraordinary hurdle it may present to some voters. Yes, out of 16,000 people who have yet to provide the state with citizenship documentation, just two people without the proper documents have made it through the new bureaucratic hurdles to prove that they are citizens….which Kobach somehow sees as a great victory. “He believes it was the hope of a fairer election among some minority communities that had experienced fraudulent elections that drives the higher turnout,” Kobach said. In fact, many elections experts say that high turnout among African-American voters in 2012 was driven in part by a backlash to voter suppression laws, not support for them.